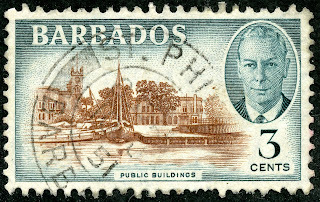 This is the second of two posts examining the stamps of Barbados, and, through the stamp portal, the history of Barbados. The preceding post is here. The original post with checklist is here. 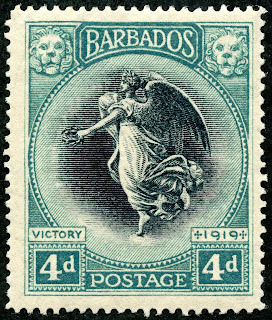 This post takes a good look at the "Seal of the Colony" stamp issues (56 stamps) of 1916-18, 1921-24 (Wmk 4 & 3), 1925-35, and 1938-47. And we will review the George VI 1950 pictorial set. 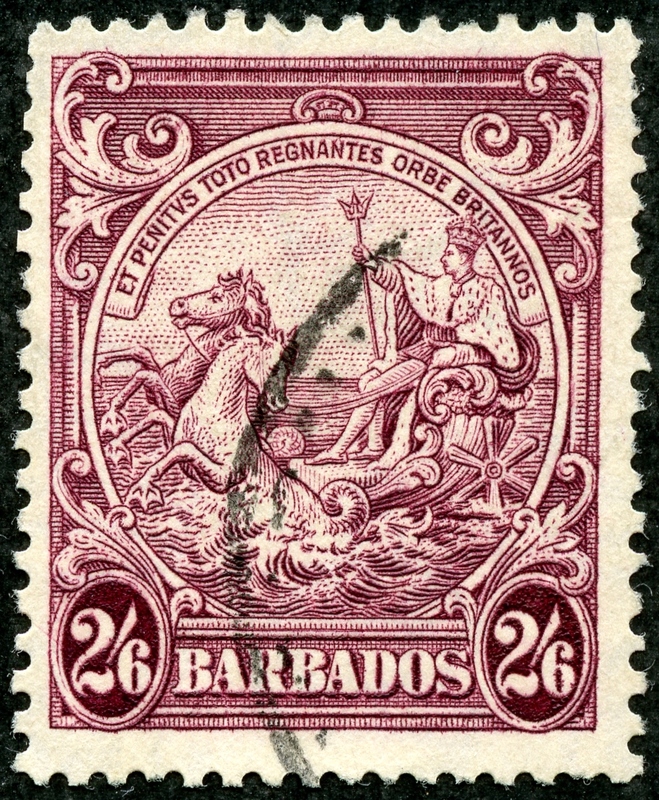 Between 1916-1947, there were a series of definitive issues featuring the "Seal of the Colony". 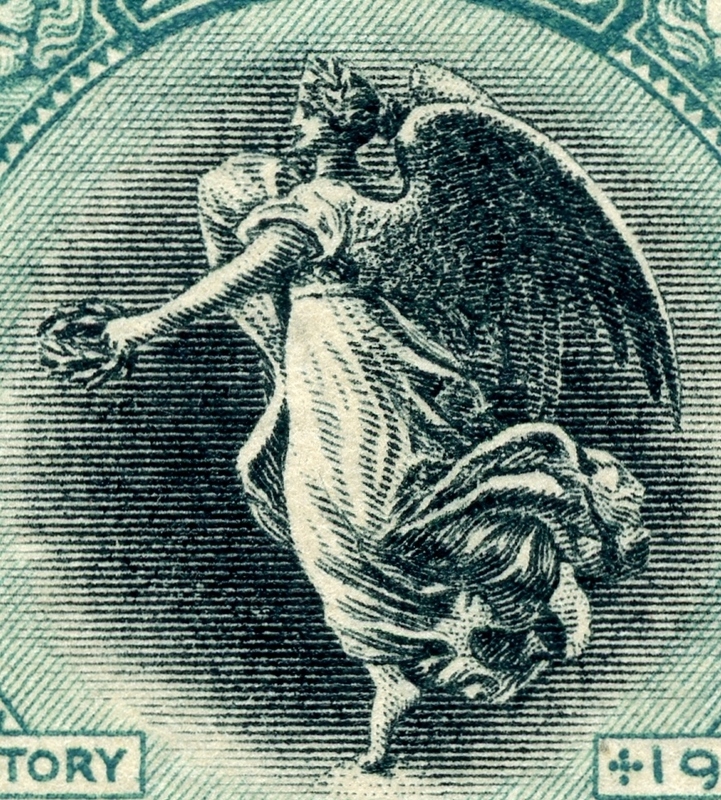 The 1916-18 Wmk 3 engraved issue has thirteen stamps, and is in a larger format (30 mm tall). 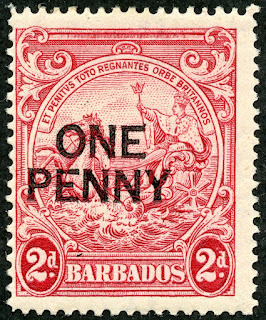 CV is <$1-$10+ for eleven stamps. 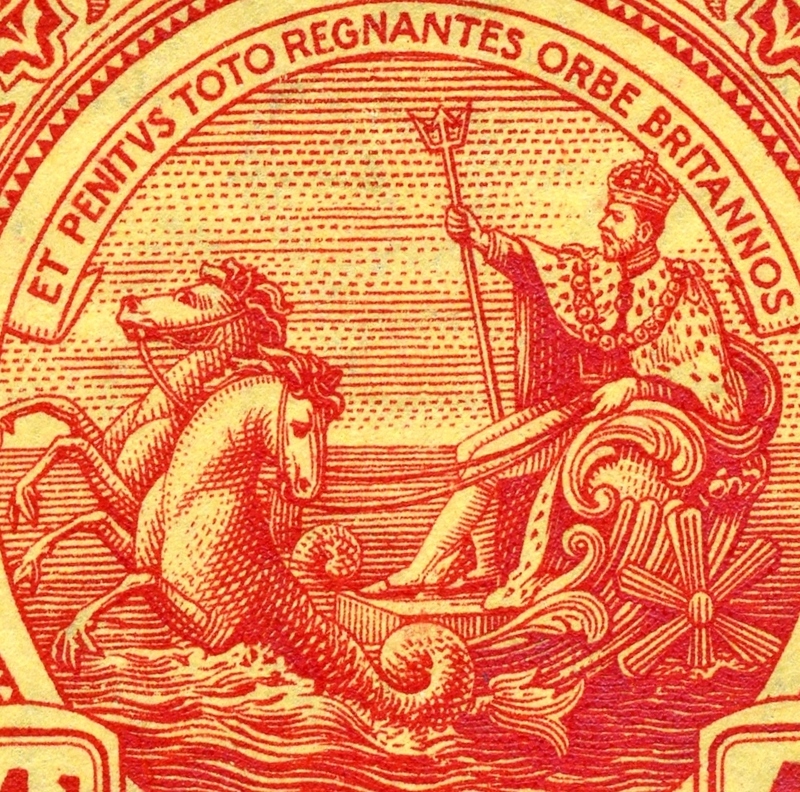 One will note the monarch, now male and representing George V, is sitting in a seahorse drawn car. The Latin phrase, which initially appeared on the 1663 original seal, and is derived from a line in Virgil's first Eclogue, and translated here "and the British ruling throughout the whole world". 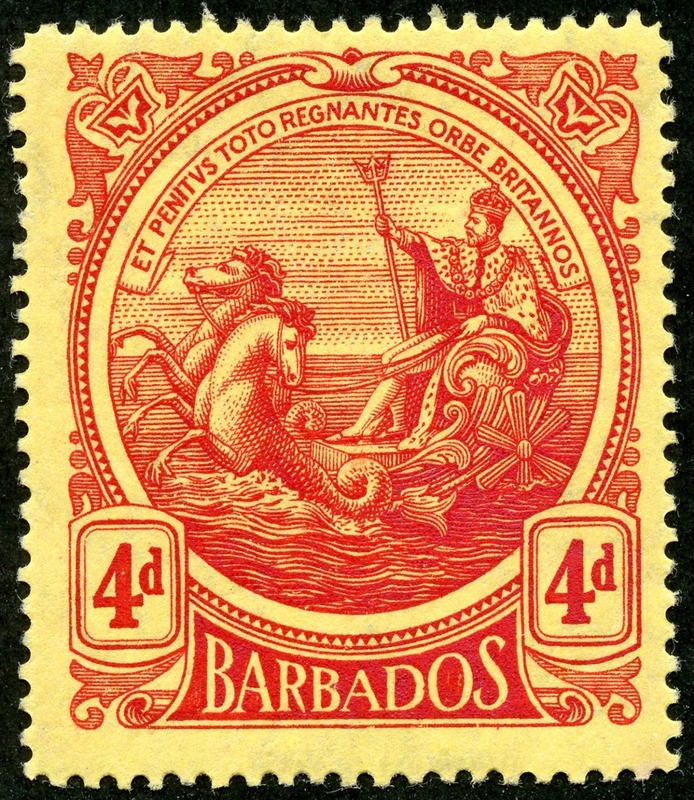 The "Seal of the Colony" motif was interrupted by a 1920 twelve stamp engraved set celebrating victory in WW I. 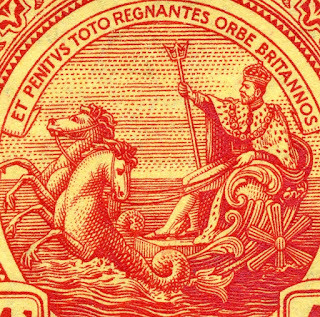 If one wants to pay careful attention to watermarks for this issue, the "Multiple Crown And C A" (Wmk 3) can be found inverted and/or reversed. They have a much higher CV. CV is <$1-$5 for nine stamps. 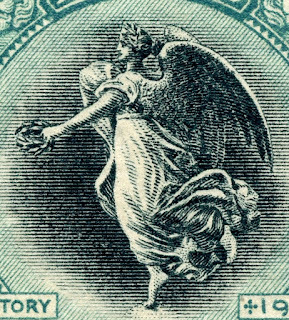 Eleven of the twelve stamps show "Winged Victory" from the Louvre. 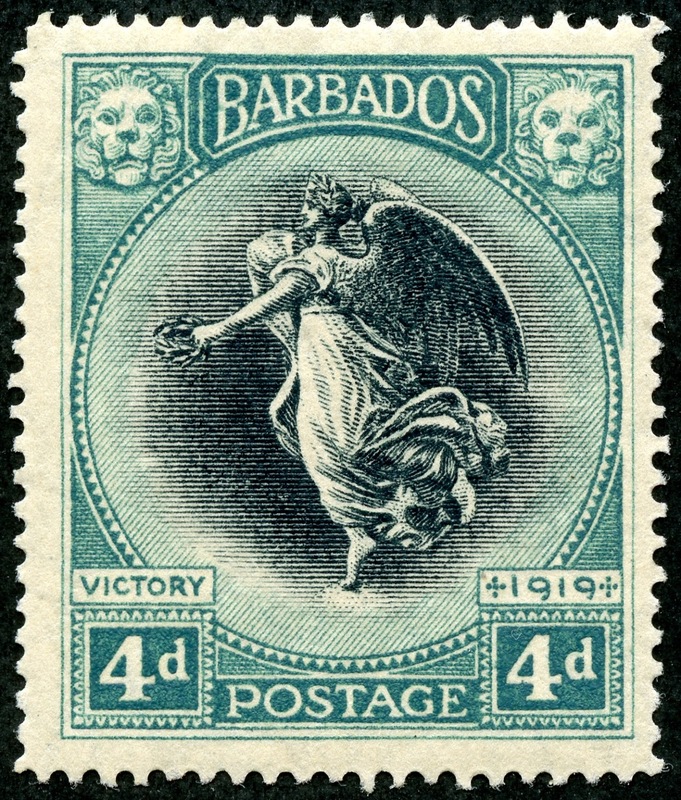 The 1sh yellow green & black has a different image, the "Victory from Victoria Memorial, London" (not pictured). Back to the "Seal of the Colony" issues. 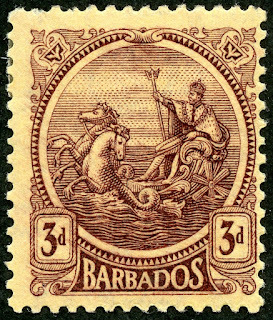 Between 1921-24, a nine stamp set was produced on Wmk 4 "Multiple Crown and Script C A" paper. This set does without the Latin inscription, and is in a small format (21.5 mm tall). 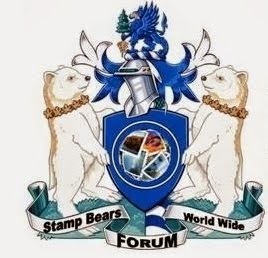 CV is <$1-$4+ for six stamps. 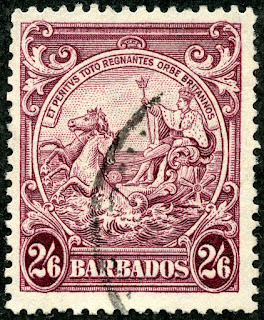 Also, there were three additional stamps in the 1921-24 issue that were on Wmk 3 paper. Two of the denominations are unique for the Wmk 3 issue (3p violet/yellow; 4p red/yellow). But the Wmk 3 1sh black/green is too similar to the Wmk 4 1sh black/emerald to confidently differentiate. Watermark the 1sh specimens for positive identification. 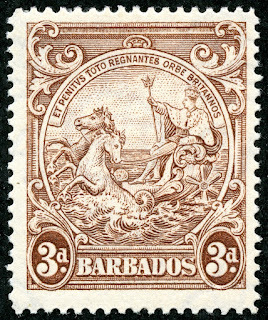 Between 1925-1935, a fifteen stamp set was produced in medium format ( 26 mm). The Latin inscription is back, but the scroll pattern on the frame surrounding the vignette is different than preceding issues. 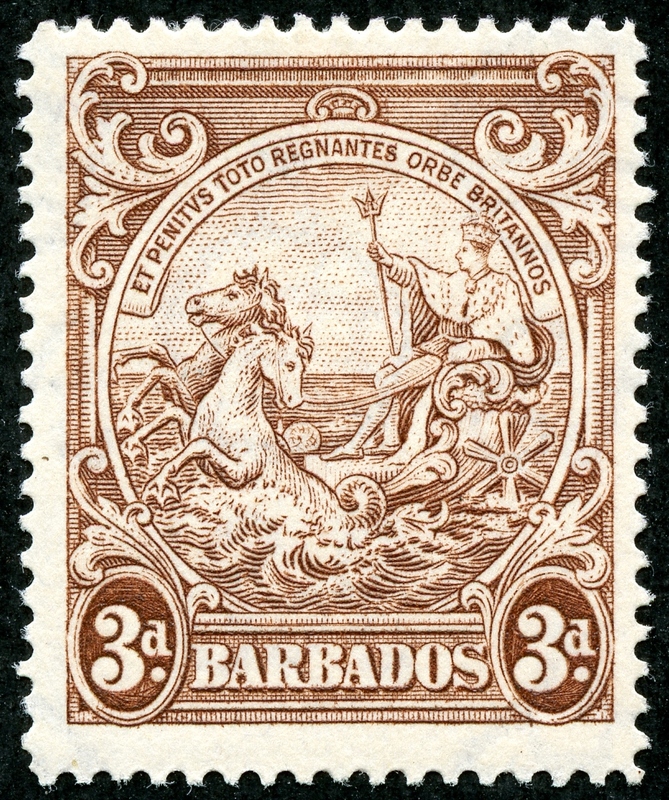 Some of the stamps issued in 1932 are Perf 13 1/2 X 12 1/2 (as the example above), but generally the Perf is 14. CV is <$1-$8 for thirteen stamps. 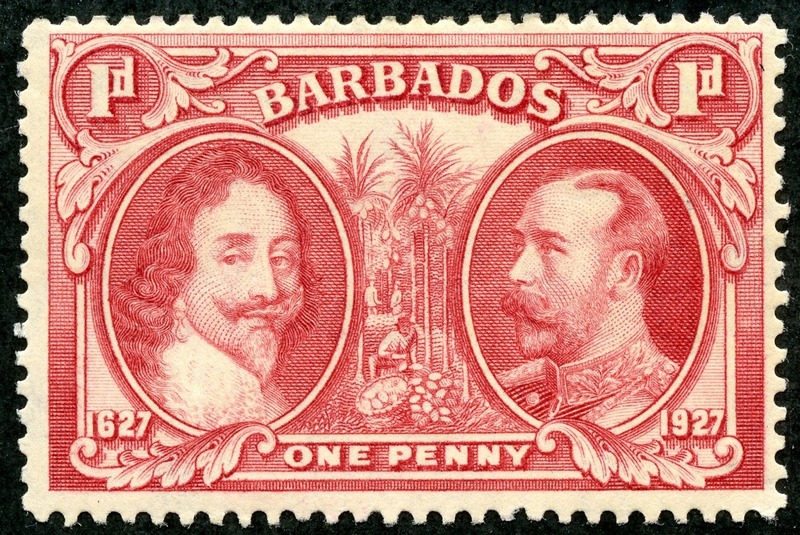 "Charles I and George V"
Between the years 1938-47, another large 16 stamp set was released in medium format. 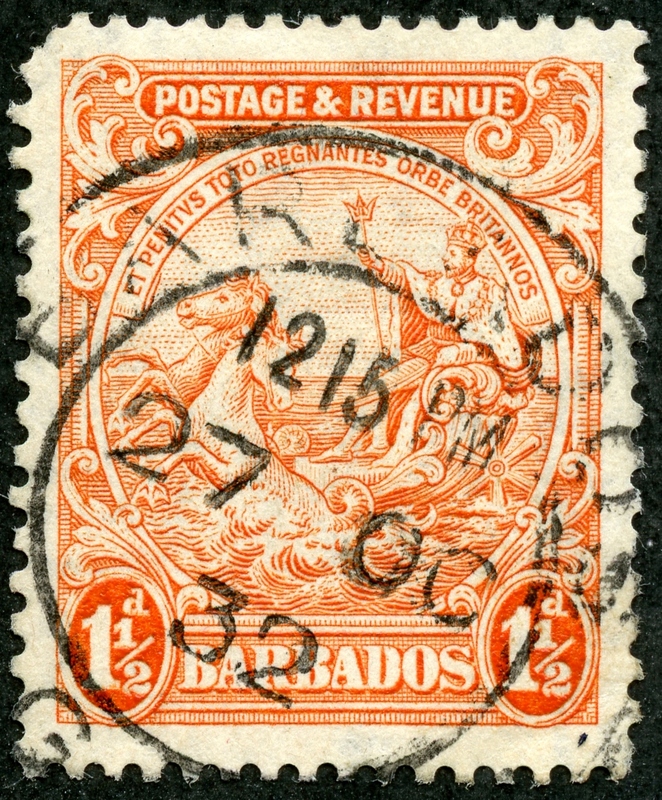 Note the "Postage & Revenue" upper tablet found for the preceding issue has been dropped for this issue. 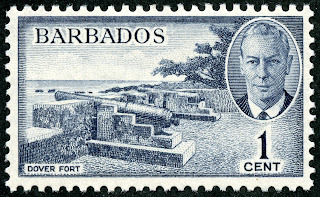 Five stamps with minor Scott numbers were issued between 1938-43 with Perf 14. 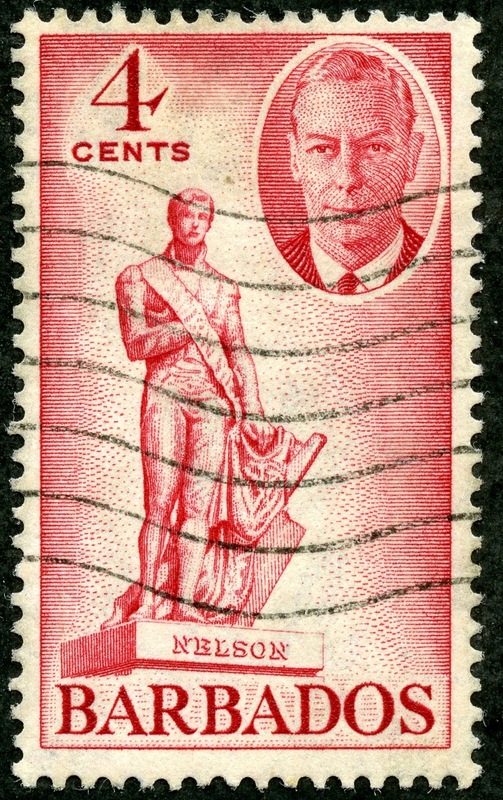 Closeup of the 1938-47 Issue: a clean shaven George VI! There is another difference, not necessarily apparent unless one pays close attention. 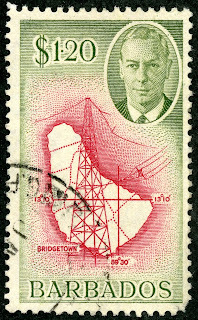 The 1938-47 issue shows a clean shaven George VI, naturally, rather than the bearded George V of the 1925-35 issue. !! 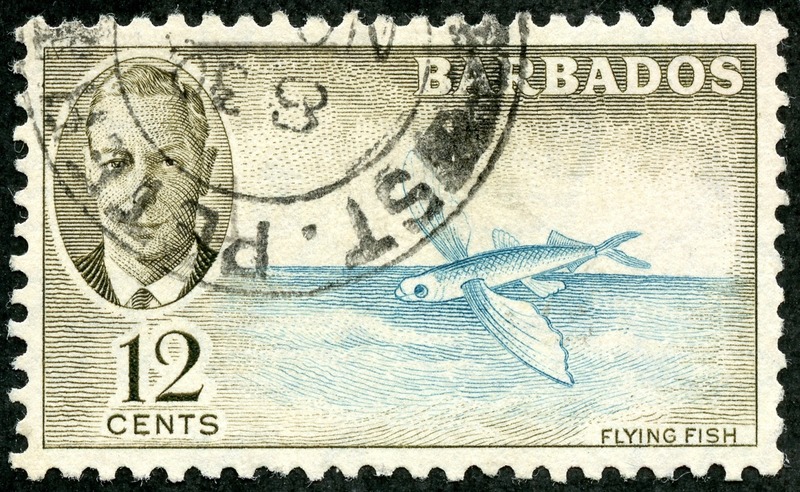 Most of the 1938-47 issue stamps are found with Perf 13 1/2 X 13. 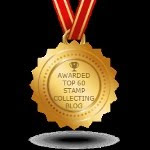 CV ranges from <$1 to $6+ for the 16 stamp denomination set. 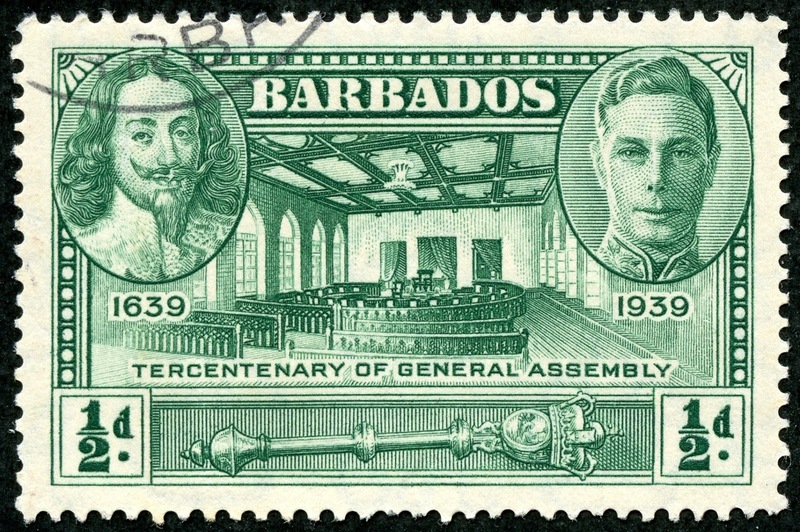 "Charles I, George VI, Assembly Chamber and Mace"
For the 300th anniversary of the General Assembly, a five stamp engraved set was released in 1939. 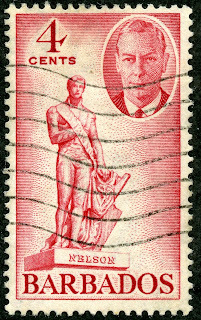 In 1947, the 1943 issue 2p bright rose red stamp was surcharged as shown (CV $2+). 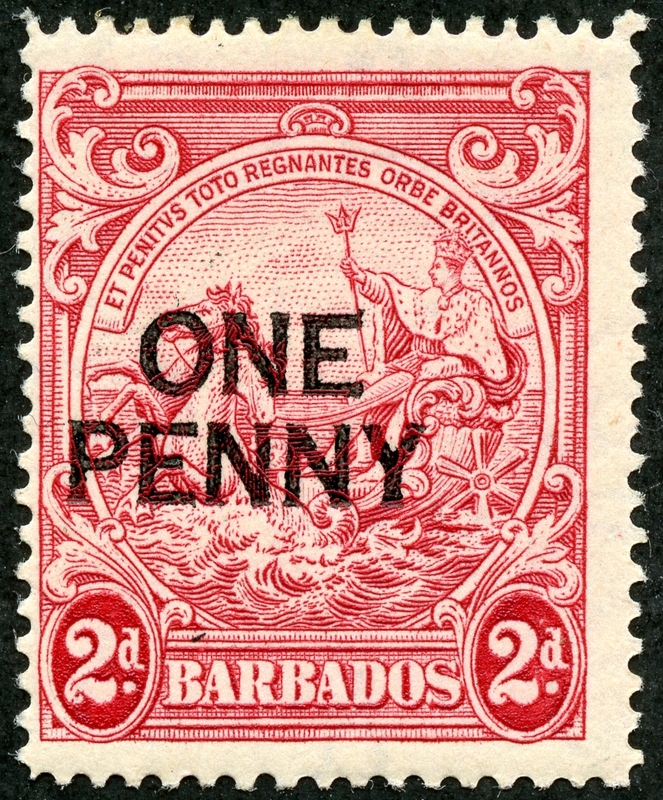 Broken and short letters can be found on some stamps. These command a much higher CV. 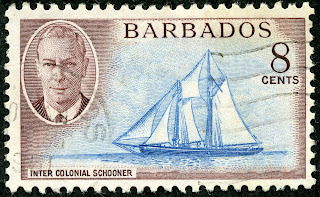 1950 Scott 216 1c slate "Dover Fort"
One of the highlights of British Colonies is the George VI pictorial sets produced for many of them. 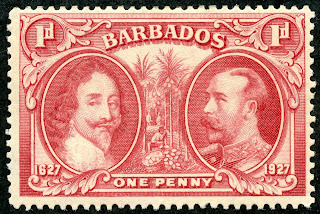 Part of the reason the WW collector looks forward to the pictorial set is the contrast they exhibit vis-a-vis the relative monotony of the monarch stamps. 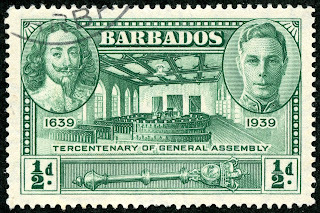 The Barbados George VI engraved set was released in 1950 with the new currency: 100 Cents = 1 West Indian, later Barbados Dollar. The set consisted of 12 stamps with 12 scenes/pictorials. 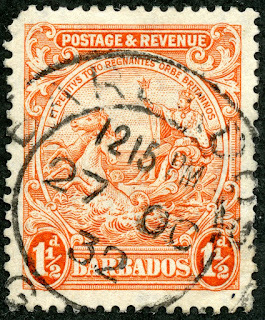 CV is <$1-$10+ for 11 stamps. The scene above, "Dover Fort" is actually hard to find on an internet search. 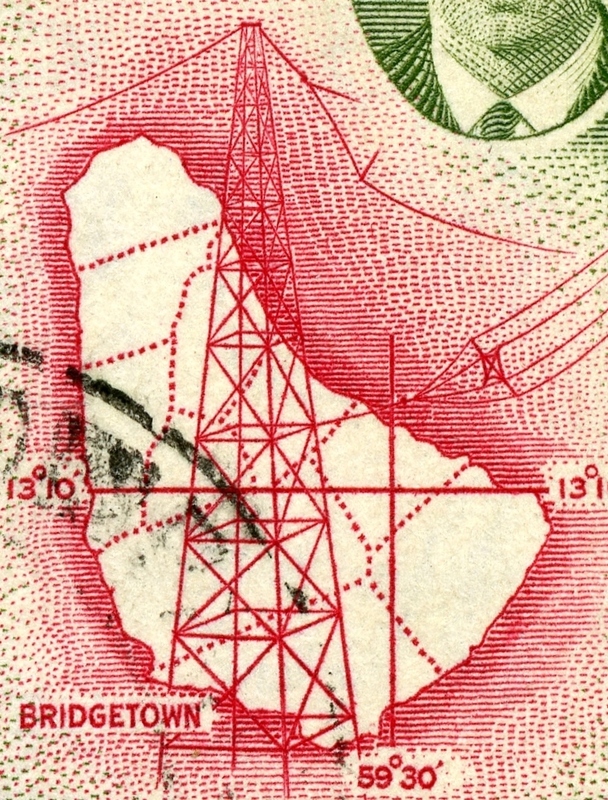 The purpose of the signal stations across Barbados, erected around 1818, was to warn the plantation owners of approaching ships, sugar cane fires, and slave rebellions.The communication was by signal fires and semaphore. Dover Fort was in St. Peter's Parish on the coast. 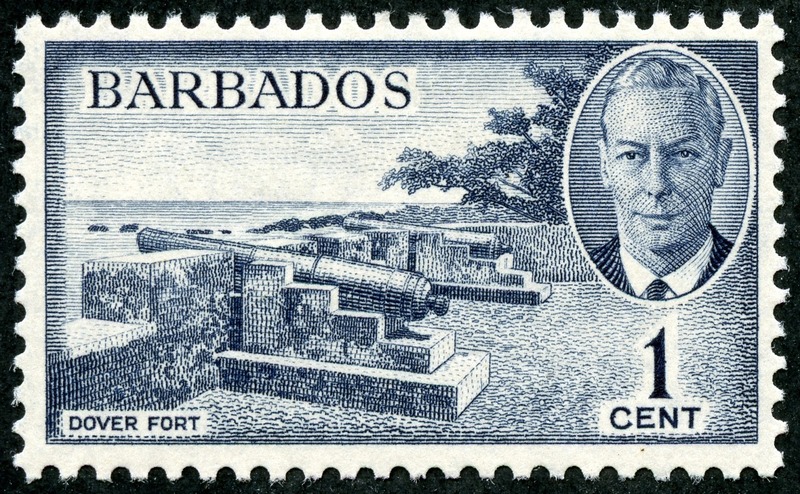 It apparently was an old small British military fort that protected the settlement of Speightstown from the "overlooking cliff to the east". 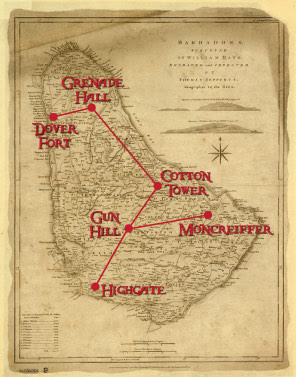 I was unable to verify if "Dover Fort" as such, still exists. 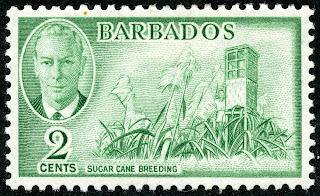 Sugar Cane was a big part of Barbados history. Initially, the sugar cane was used for feeding livestock, as fuel, and for the production of rum. 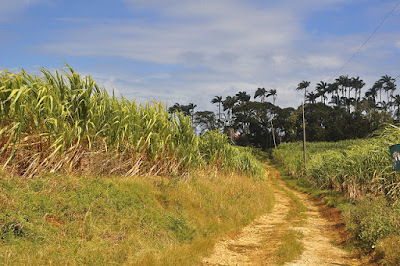 But, by 1644, the larger plantations were exporting sugar. 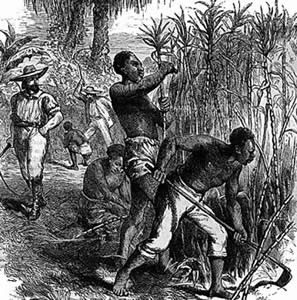 Sugar Cane had to be harvested by hand, and slaves were an essential part to the enterprise. This continued until the Slavery Abolition Act of 1833. 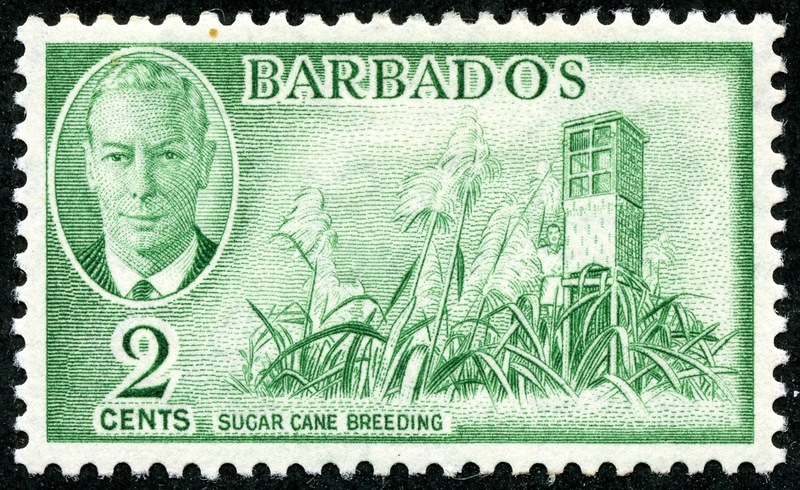 In the 1800s, there were ten sugar factories in Barbados, but declined to two by the 1900s. 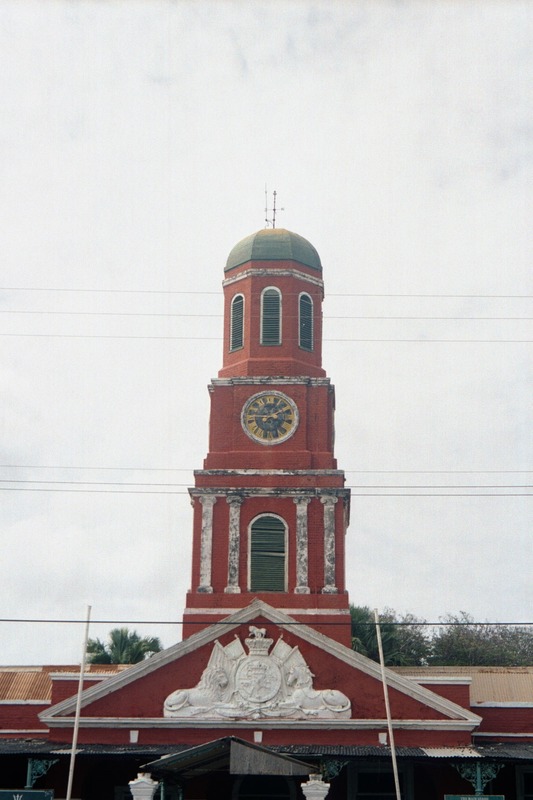 In Bridgetown, Barbados, the statue of Admiral Lord Horatio Nelson was erected in 1813. 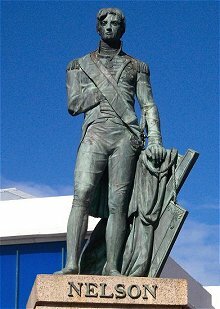 Why a statue of Lord Nelson in Barbados? 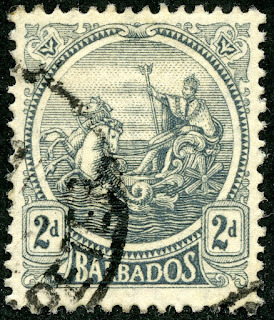 If Nelson had not gained victory off Cape Trafalgar on the southern coast of Spain in 1805 during the Napoleon Wars, assuring British naval supremacy for the Britain to Barbados trade route, Barbados would have become a French colony, in the minds of the "Bajans" (Barbadians). To show appreciation, funds were raised, beginning in 1806, and the land on which the statue was erected in 1813 was named Trafalgar Square. Wreaths were laid at the statue on the anniversary of the Battle of Trafalgar (October 21st) for many years. 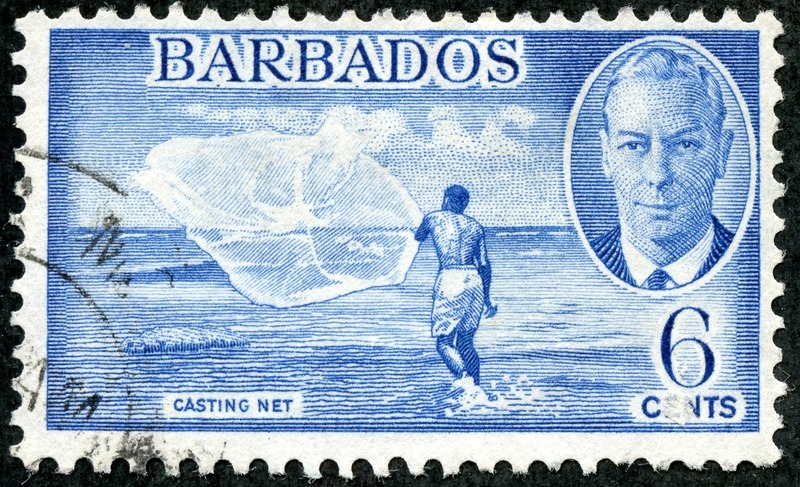 1950 Scott 220 6c blue "Casting Net"
Barbados is known as the "land of the flying fish" (See "Out of the Blue" header stamp). 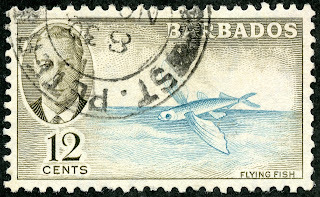 There are some 500 fish species in Barbados waters. Most of what is caught is White Marlin, Mahi Mahi, Wahoo, Sailfish, Yellowfin Tuna, and Barracuda. 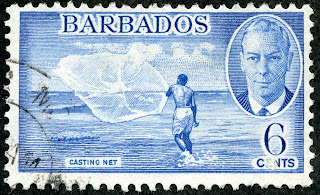 As depicted by this stamp, fishing from the shore is done by casting from the beaches and catching fish (Bonefish) in the surf. Sloops and Schooners were used between Caribbean islands, including, unfortunately, transporting slaves in earlier times locally. 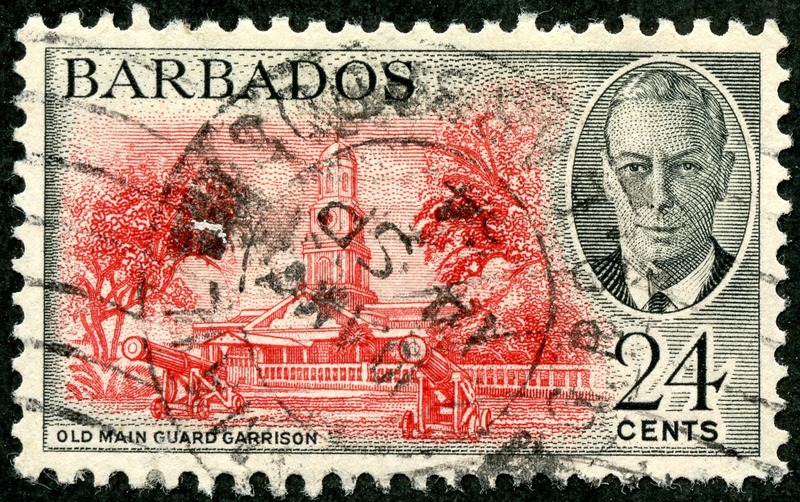 The Garrison in Bridgetown was the headquarters for the British West India Regiment in Barbados. 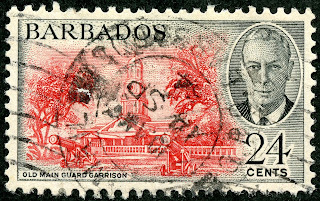 The stamp has an image of the clock tower on the main guardhouse. One can see the white Coade stone, with the carving of the George III Coat of Arms. 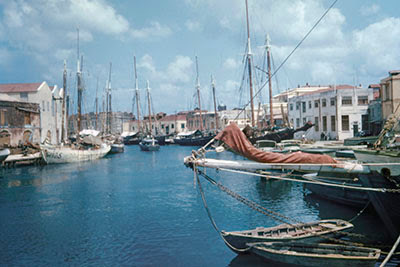 The Careenage is in the center of Bridgetown, and is an area where traditionally ships were careened onto a side to be repaired or painted. The busy area was often filled with docked ships, unloading merchandise for the nearby warehouses. 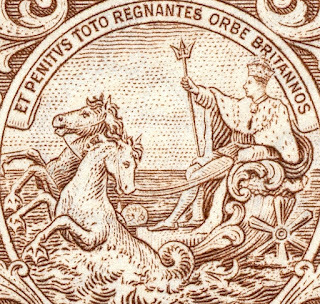 Here is a pic of the Careenage at about the time the stamp was issued. 1950 Scott 226 $1.20 olive & carmine "Map"
Besides a map of Barbados, the stamp depicts a "wireless mast". This is a communication tower radio mast with aerial antenna. 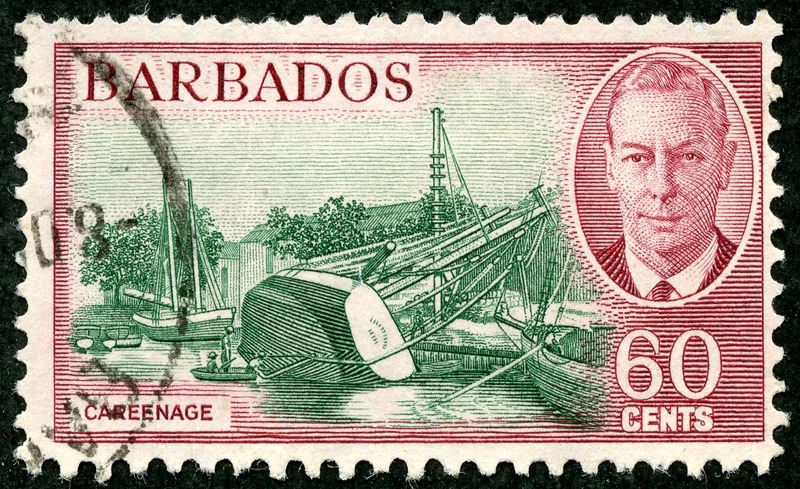 But why on a Barbados stamp? 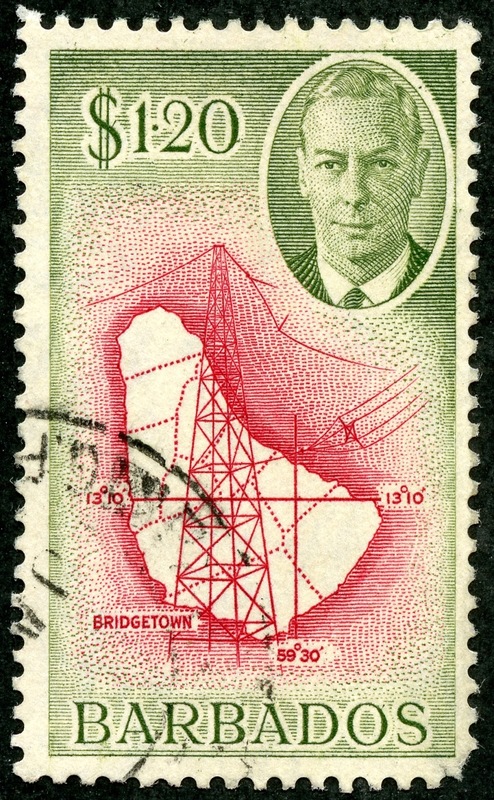 Barbados became a major telecommunications hub in 1944 with transmitting and receiving stations for high-frequency (HF) signals propagating through the ionosphere. 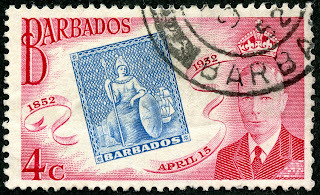 Finally, Barbados celebrated their 100 year stamp history with a four stamp set in 1952. 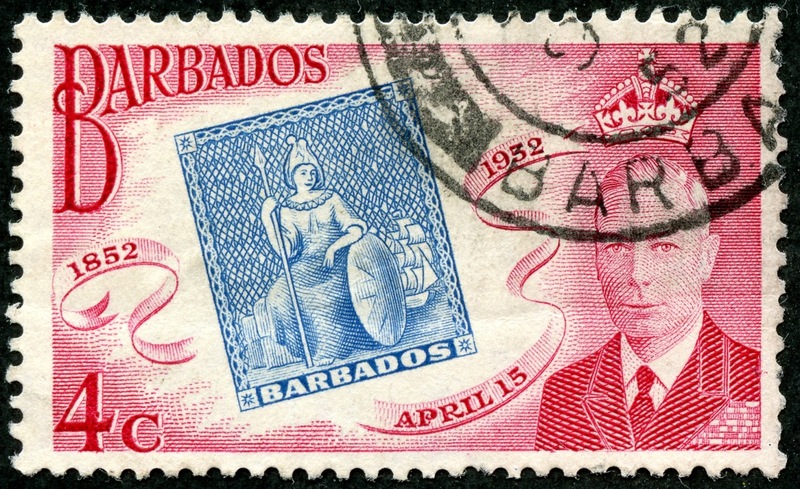 Each of the four 1952 issue denomination stamps had an example of the 1852 "Britannia" in deep green (1/2p), dark blue (1p), slate blue (2p), and brown red (4p), respectively. 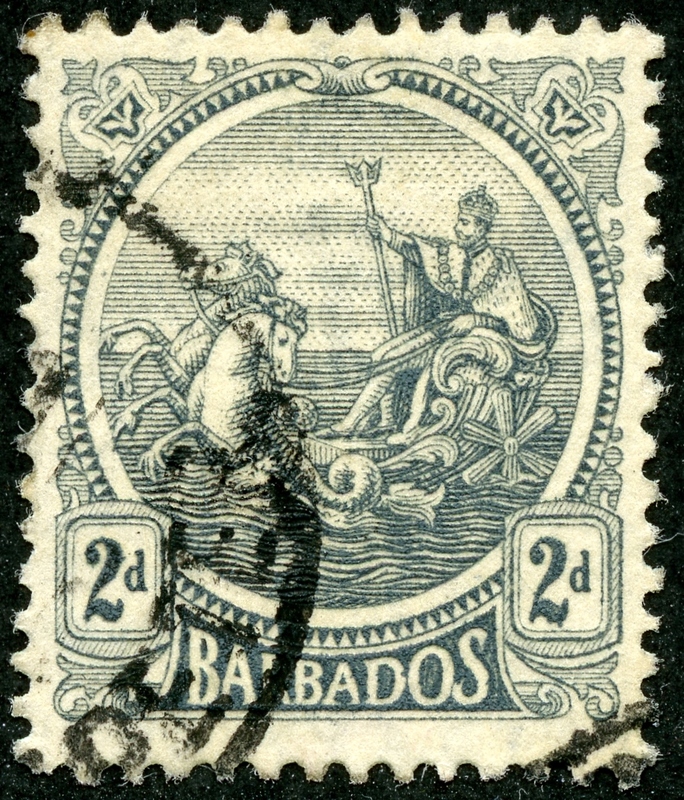 So closes, in a very pleasing ending, our journey through the classic era Barbados issues. Wow! 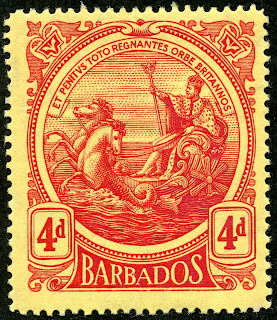 I've developed a new appreciation for the classic era stamps of Barbados, and the interesting history that the stamps reveal. 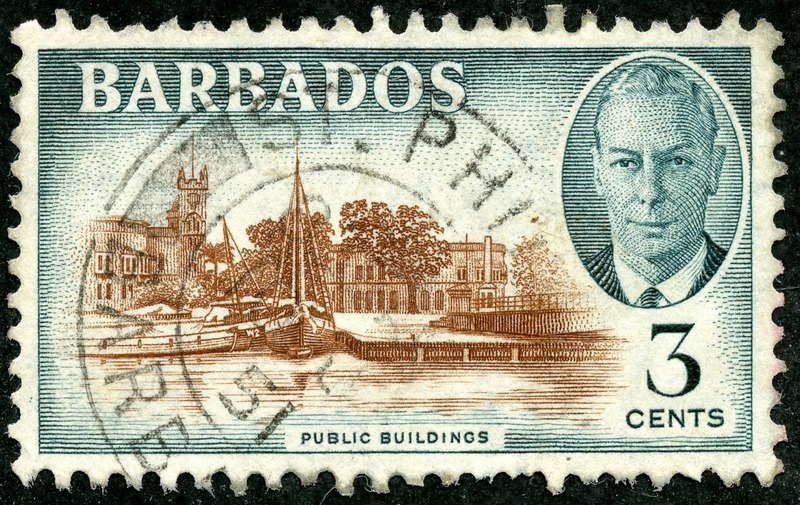 Note: Pics of the Careenage, main guardhouse clock tower, Lord Nelson, sugar cane field, and Barbados Plantation slave drawing, and signal station map: All appear to be in the public domain. "There appears to be pineapples illustrated between the vignettes?" Maybe coconuts. 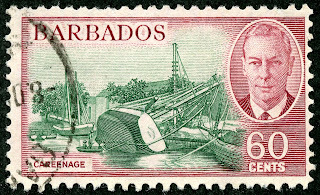 "In the past, in Barbados, coconut trees were most commonly found scattered along coastal areas." So they did grow there. Thanks Bud." It must be coconuts, since pineapples doesn't grow on trees. Well of course. Thanks Steamboat. Now that we've settled on coconuts, notice also that three people appear in the vignette. In the foreground a black man sorts the coconuts, and in the background two white men appear to be negotiating a price for a pile of nuts. 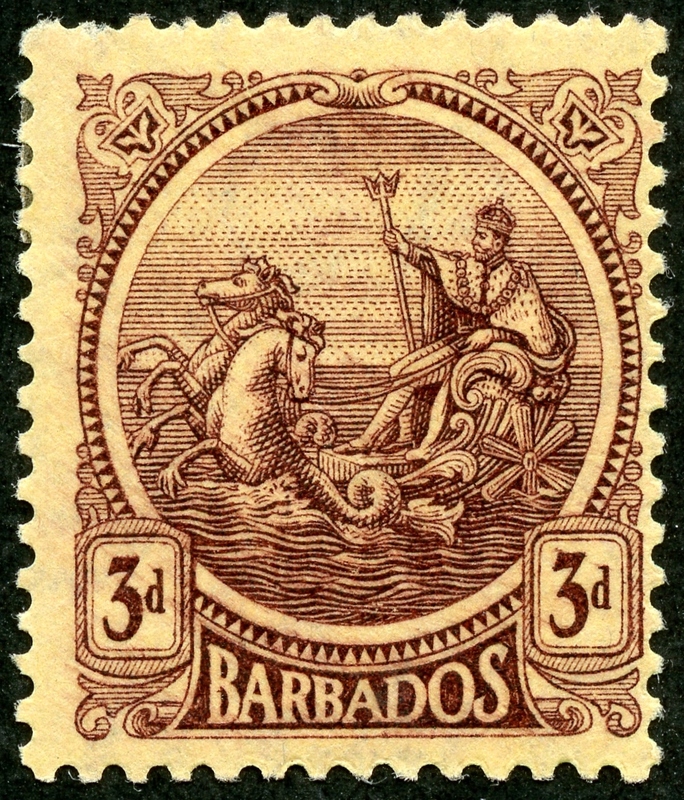 Colonialism was not yet dead when this stamp was issued. Still isn't. As I recall from France B66-67, the Winged Victory from the Louvre has no head. Those two stamps have been on my radar for a cheap acquisition for 20 years, with no luck. Yes, no head. ;-). Only on sale at the Louvre.